I love the symmetry and framing. The angle not only creates the square, but also creates all those rounded arches. Really cool. perfect framing and composition. really impressive. Tan interesante es el marco que no importa que el lienzo este vacío. Just wanted to say that I love the symmetry in this crop! I commented on this one with your previous blog but I still like this one! el processat...com sempre molt bo! I agree that it is very surreal. I love it though! 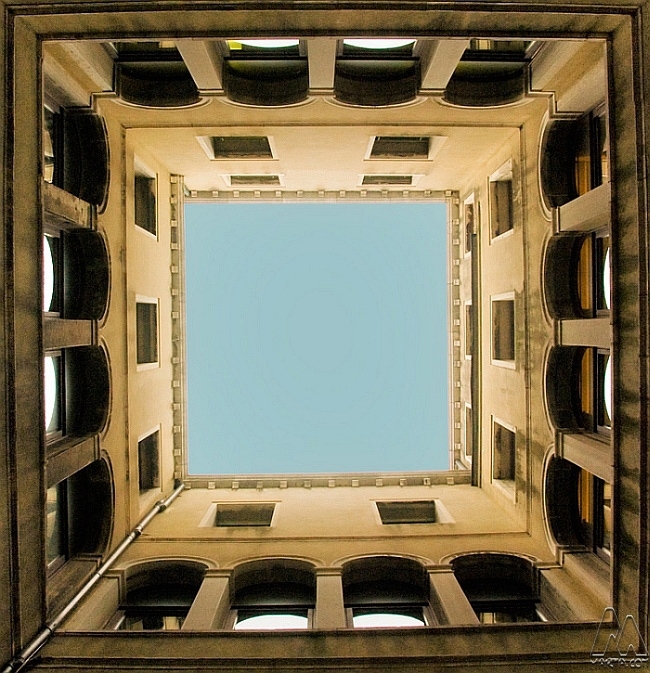 A courtyard of claustrophobic proportions very well captured. klasse gesehen und sch�n in szene gesetzt! das geht aber kaum ohne stativ, gell? wowww! awesome composition! i love the symmetry and colors. nice contrast too. Absolutely excellent shot. I also like the coloring and tones. Wonderful work m a r t a ! Perfect symmetry in this shot. Fantastic composition and great details. Very nice work. Hi marta, geniales Bild, das Motiv hat mir selbst so gut gefallen das ich in meiner Sammlung exakt das gleiche Bild habe. Sch�ner Helligkeitsverlauf. Wenn ich mal fragen darf, warum sind Deine EXIF-Daten nicht sichtbar? Ist das ein Bug von Folderblog? Niels -you are so right. I updated the picture with the square crop. It looks better even though you lose depth and you can see the lens distortion clearly. Klaus -kein Bug, obwohl Folderbolog hat Probleme mit der Belichtungszeit bei Bildern von der D70/D80. Beim Bearbeiten der Bildern �berscheibe ich �fters die EXIF, deswegen ist es nicht da.
! Molt b� marta .� Saps que ho fas molt b� ? i un altre cop... la gent s'avorreix! i no sap que fer! i es passa la vida, escribin comentaris de mal gust, degut a l'enveja! quina gent, m a r t a! i jo pasava per aqui, per veure la proxima imatge! Looks very surreal. Good shot m a r t a! ja no se on m�s posar�s la c�mera ...a terra, penjada, sota l'aigua. Muy bueno el encuadre... parece un cuadro. I really like the formatting of this shot! You took a normal architecture picture and cropped it into something fantastic! I really like it when you experiment, like the ghost pictures you did as The Shining. You need to venture more like that! wow -this is an awesome shot -yeah! a square in a square in a square in a square in a square -great job! Great warm tones with the touch of soft blue in the middle. Really like the perspective here and the symmetry too. Surreal! Looks great! Well done. auf den ersten blick das perfekte renaissance gemälde - auf den zweiten blick ein sensationelles foto. ein quadrat kann nicht schöner ausgefüllt werden! T'has estirat a terra, per fer aquesta foto??? Felicidades por esta nueva doble nominación familiar en PhotoFriday!